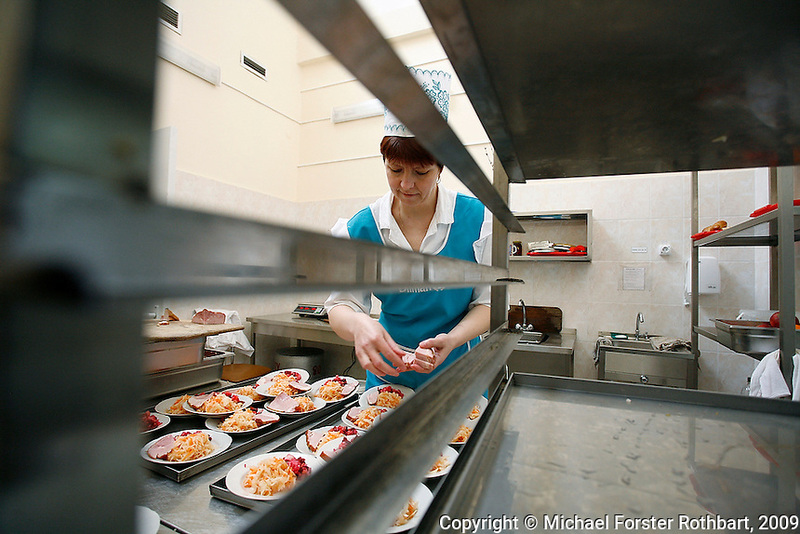 Cooks in the two large cafeterias at the Chernobyl plant prepare lunch en masse for 3,800 workers daily. Although the kitchen staff complain about low salaries, they have few other options for employment. The Chernobyl Nuclear Power Plant (ChNPP or ChAES) is the site of the world's worst nuclear accident. On the night of April 26, 1986, the Fourth Block reactor exploded during a safety test, sending radioactive particles into the atmosphere and eventually around the world. The population within 30 kilometers was permanently evacuated, including residents of Pripyat and many villages. Although ChAES stopped generating electricity in December 2000, today 3,800 employees continue to work at the plant, commuting from the new city of Slavutych (population 24,300), which was built after the accident to replace Pripyat.